Selling automobiles was always Jeff Jones’ dream. From a young age, Jeff enjoyed cars, from the fancy Cadillacs to the dependable Chevrolets, Jeff loved them all. So it was no surprise to his family and friends that Jeff, fresh out of school and full of ambition, went to work for Lowry Chevrolet. It was 1980. Following Mr. Lowry’s death in late 2008, the Lowry family chose to sell the dealership. Lowry Chevrolet had seen declining profitability for the last few years, and with the onset of a severe economic recession, it was going to take the right set of circumstances. Jeff saw the potential, and knew the risks – it was the perfect time to step in. 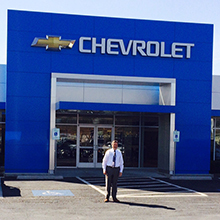 In April 2009, and with the help of an equity partner, Jeff and his partner created Paris Chevrolet, and purchased the assets of Lowry Chevrolet. The acquisition may never have happened had General Motors Corporation not been facing its own demise from the economic downturn. Jeff’s partner provided the working capital for financing the dealership’s inventory but allowed Jeff the opportunity to run the dealership in his own way. After a year of operation, Jeff sought help from the Paris SBDC to buyout his partner and gain full ownership of the dealership. The counselor guided Jeff’s creation of his business plan, and worked to find a financial institution interested in this opportunity. But Jeff quickly found out that bank financing was not available, with or without an SBA loan guarantee. So he changed strategies, but continued on his quest. Jeff returned to the Paris SBDC to work with its Director, Brad Gottshalk, a former banker and SBA lender. Together, they assembled the requisite analytics and developed a credit presentation packet for consideration by local banks and the CDC. The presentation proved convincing, financing arranged, and construction began. Once the dust settled, and all the EBE improvements in place, Paris Chevrolet continues to set new sales records unseen in the past decade for that dealership.